After sending the seniors out in style against Arkansas, Bud Foster is already making plans for spring ball. Immediately after Tech's mammoth comeback against Arkansas in the Belk Bowl, Justin Fuente wasn't quite willing to go all the way and say the win proves that the Hokies are a national force once more. Senior DE Ken Ekanem had no such reservations. "Virginia Tech's back on the map," Ekanem said after the 35-24 victory that gave Tech its first 10-win season since 2011. "It was just cool getting Virginia Tech back to the vision when I was recruited, back to 10-win seasons. You couldn't draw it up any better at all." Ekanem might not have been part of the best teams in Tech history, but he does get to end his career as part of the first Hokie squad to win three bowls in a row, and go out in a blaze of glory that he says he won't soon forget. "It was a game I'll always remember and tell my grandkids about," Ekanem said. A game featuring 35-0 run in the second half is indeed quite the win for the senior class to go out on, but Bud Foster thinks it's plenty meaningful for the coaching staff as well. The longtime DC has never been shy about heaping praise on Fuente, and he felt the big bowl turnaround is the perfect example of why Whit Babcock made the right choice in bringing the former Memphis coach to Blacksburg. "I've been, to be honest with you, overwhelmed by just how good Justin is," Foster said. "I'm really impressed by his maturity as a young coach. He's a deep thinker, and the things that he says and brings to the table for our team day-in, day-out, week-in, week-out with different things that are motivating tools, maybe teaching tools. I've just really been impressed by his body of work and what he's about." Foster isn't the first coach to compare Fuente to his predecessor from Fancy Gap, but he emphasized that the team's sudden return to relevance wouldn't be possible if the new head Hokie didn't have a little Frank Beamer in him. "He reminds of coach Beamer 30 years ago when it's all said and done," Foster said. "A guy with a lot of energy and a lot of enthusiasm, but a new generation, and I've been extremely impressed by him and how he's handled the transition. I will say this, Coach Beamer has been phenomenal about standing back and letting Justin do his thing, but at the same time, you see how Justin, he's a football fanatic, and you see how he's embraced 25 and Coach Beamer's tradition, and I think that makes a statement about him and this football team and this program, but also how he cares about the game." While Fuente and Foster certainly deserve their fair share of credit for the team's monster bowl comeback, seniors like Sam Rogers still had to fight off the urge to quit as they headed into the locker room after a devastating first half. Rogers said the thought that he might end his storied Tech career with an embarrassing performance on a national stage never truly crossed his mind, and he worked to make sure everyone else on the team was similarly focused. "You can't think like that, because if you do, it's like giving into the mentality that it's going to happen," Rogers said. "So for me, when those thoughts do creep in, you cut them off and say, 'No we're going to go win that game, we're gonna win that game.' You take it one play at a time, and that's what I just kept telling the guys." But Ekanem admits that doing so wasn't quite so easy for everyone, especially his fellow defensive linemates. "It was a little upsetting at first, like, 'Wow this is really happening,' going into halftime at 24-0, with the weirdest calls, probably one of the weirdest called games I'd ever been a part of," Ekanem said. "We knew tensions were flaring and people were just pissed on the line, a lot of no calls, so we knew we had to make something happen." By the time the first half ended, Ekanem said "we were just angry going into halftime," and it showed in the second half. "We let it out on them," Ekanem said. Indeed, the defense's six sacks and constant pressure on QB Austin Allen had a huge impact on the second half, helping to generate three interceptions that all led to Tech touchdowns. "We knew coming into the game that the QB got hit a lot each game, so we knew that there was a lot of potential for us to bring a lot of pressure, and pressure makes QB overthrow the ball," Ekanem said. "So once we started doing that, it led to (Tremaine Edmunds') pick and after that, it was pretty much game over." Rogers called it the "story of the second half; the defense gets a turnover and we capitalize," and the fullback had a big hand in the process with his fingertip TD grab to make the game 24-14 in the third quarter. "Personally, it felt better for me because I missed a block on a previous drive when I was in gap protection and I thought I had help inside and that was my fault, I messed up the protection," Rogers said. "So being able to get the touchdown kind of calmed down a bit." But when one reporter had the gall to suggest that grab was "pretty athletic for a fullback," Rogers seemed a little less than calm. "It's the most backhanded compliment, 'For a fullback,'" Rogers said with a smile. "People always say, 'Pretty athletic, for a fullback.' What does that mean? You might as well just call me not athletic." 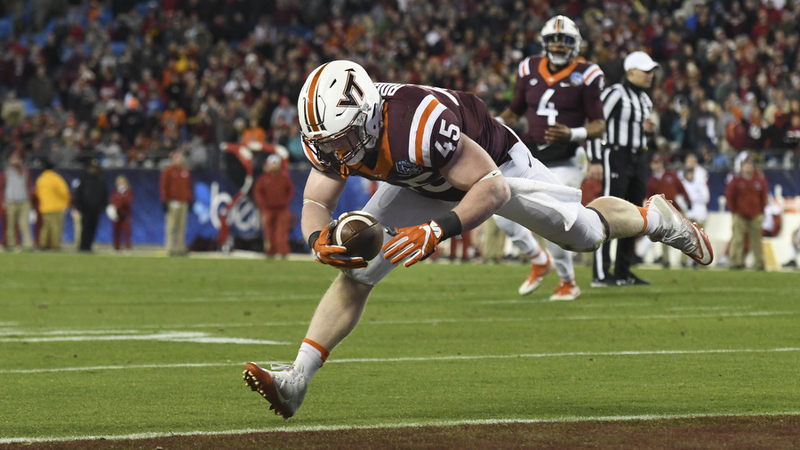 After such a thrilling win to send off the team's seniors, emotions were sure to run high for the Hokies after the bowl game's end. But the sudden passing of former Tech DB Keion Carpenter immediately before the game added an extra layer of poignancy to the team's big victory. 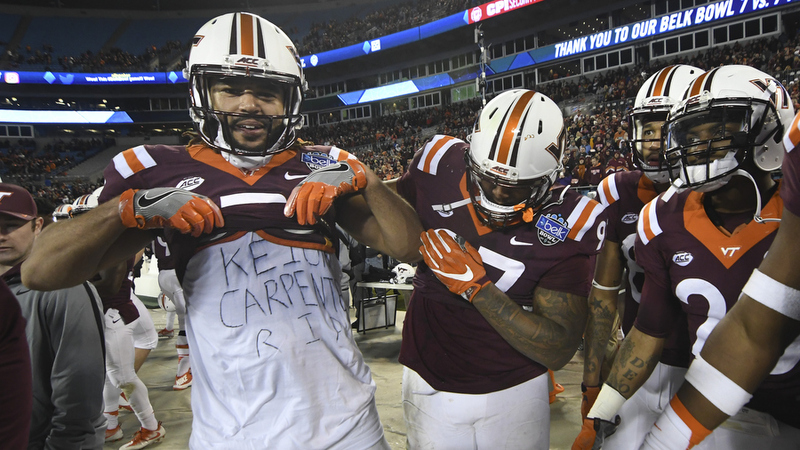 TE Bucky Hodges payed tribute to Carpenter with an undershirt that he flashed after the game, catching Foster by surprise. "That's pretty impressive," Foster said. "Some of those guys don't know Keion, but we made a point (Wednesday) night defensively to let them know who he was and what kind of player he was, what kind of person and teammate. He's a brother, and to me he was like a son, and it was a tough time." Foster isn't shy about wearing his heart on his sleeve, especially after games, and he couldn't help but get choked up when describing just how Carpenter's death at 39 affected him. "It kind of caught me off guard," Foster said, his voice cracking as he held back tears. "Because we're going in to have a big night with our seniors, and it just kind of took me aback, but I thought it was important that our kids know who he was and what he meant to this program. He was a big part of us taking the next step as a program, and to lose such a fine young man at a young age, it's like losing one of your kids. I couldn't imagine, but it's devastating for their family, and we just wish them the very best." With the thrill of the bowl win already fading in the rearview, Foster now has to turn his attention to spring ball. It may seem plenty far off, but Foster knows he doesn't have much time to figure out how to replace defensive stalwarts like Chuck Clark, Woody Baron, Ken Ekanem and Nigel Williams. "With Chuck Clark and those three defensive linemen, we lost almost 600 tackles, 96 TFLs and 38 sacks," Foster said. "That's pretty good productivity, and those guys are going to be tough to replace. But I do like Tim Settle, Ricky Walker, Trevon Hill." But with Hill and fellow DE Vinny Mihota set to be out for spring practice as they recover from offseason surgeries, Foster is anticipating plenty of playing time for some of the least experienced players on the roster. "Those young ends are gonna grow up in a hurry because they're gonna get a lot of reps," Foster said. "I'm excited about spring, but we're going to be shorthanded because of some injuries." Foster admitted that it's a small consolation that Hill got the chance to play in the bowl game in Mihota's place, and expects that he has a "dynamic future" in front of him. Yet he's also anticipating lots of snaps for some recent signees, including one who signed as a linebacker and now seems to be making the permanent move to the defensive line. "Houshun Gaines is going to get a lot of reps, Emmanuel Belmar is going to get a ton of reps," Foster said. "We're going to have some guys that are going to have to grow up a lot, but I'm excited about them at the same time, I really am." Luckily, Foster has done all this many times over. "That's kind of what we've done over the years, we've passed the baton," Foster said. "We have these meetings defensively, and that's a big part of the kids seeing what it takes to be successful, and what these guys put into it, and that's good for the young guys to see and we pass the baton onto them and it's their turn. Some are better than others, but at least you've got a good foundation, and that's what this senior class has done." While I know Dadi was about the same size, I feel we were far more successful with more "normal" sized DE's this year! What about Seth Dooley & Jimmy Taylor who fit that mold? And there is Fullwood too, but think he's destined for an inside role. I'm very curious to hear French's thoughts on Belmar's projection at this point. Belmar I thought would be a backer, but Bud has used the backers over on the edge as a stand up edge more frequently over the last three years so there is something to that hybrid description that Nathan Proctor has used in interviews. Unrelated, and I want to say it because it is fresh in my mind, the growth of Tremaine Edmunds from last year's bowl game to the Belk Bowl has been a marvel to see and I probably have not done him justice in my column. The same could be said for his brother as well. I think it is a forced move to to a lack of bodies at end. I hate it and look forward to the day when we don't have to move guys "down" any more. I'm sure Belmar has put on some muscle mass during his redshirt year. Wouldn't be shocked if he comes into spring practice at 240-ish. What's his game? He expected to be a game changer? Love the man crush between Fuente and Foster. Awesome game and win for the team. Sets the stage for the offseason. Is this reporter still alive? Side note for Alex: After several games this year I saw reporters complaining that fans were allowed into post game press conferences most notably Nick Saban's, where people had to be told to stop clapping and shouting after his answers. Was this an issue at Belk also? I want to see what Fullwood can do as a DL. He's been nothing but a team player, cheering the team on the sideline. I like Hokies playing in the NFL, but I like Hokies playing in Blacksburg more. I like Hokies, wherever they're playing. I don't like anybody better than the Fullers. Plus, one of the Edmunds went to Maryland, so I feel that one must deduct points for that. That said, I love the Edmunds anyway, just not more than the Fullers (as if that were possible). Those guys had a great game!